There's rarely such a thing as a nice, sunny winter day in Salt Lake City. The good days—whether you're a snow person or not—are when storms roll across the Great Basin and pummel the Wasatch Range. When the snow stops and high pressure moves in, a brown cloud of pollution settles in the valley. In other words, when you're not shoveling, you're suffocating. It's not quite the image marketers have in mind when they promote "Life Elevated" to the state's $7.6 billion tourism industry. And it's not very conducive to getting out for a winter spin on your mountain bike. Last Saturday, more than 4,000 people converged on the Utah State Capital, not far from the iconic I Street dirt jumps, to send a message to elected officials that, simply: they've had enough. One of the groups getting the word out about the protest—dubbed the Clean Air, No Excuses Rally—is Athletes For Clean Air (AFCA), a nonprofit organization co-founded by professional downhiller Amanda Batty, along with pro snowboarder Tony Pavlantos. AFCA is a loose confederation of athletes—mostly bikers, skiers and snowboarders, for now—pushing to help educate people on Utah's air quality issues. "We want to give people the education and resources they need to make informed decisions—from the health and economic statistics to exposing the commercial and political relationships that keep us in a polluted fog," Batty says. "We aim to inspire people to examine their personal lives, and to make better choices to cut down their contribution to the bad air quality." 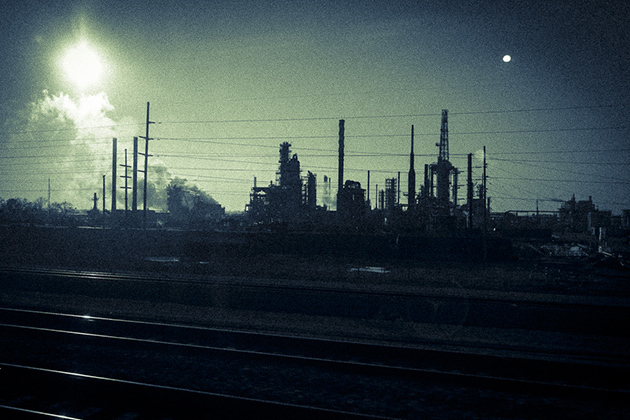 In the grand scheme of Utah's fight for clean air, AFCA is a small, but emerging, voice clamoring for change. 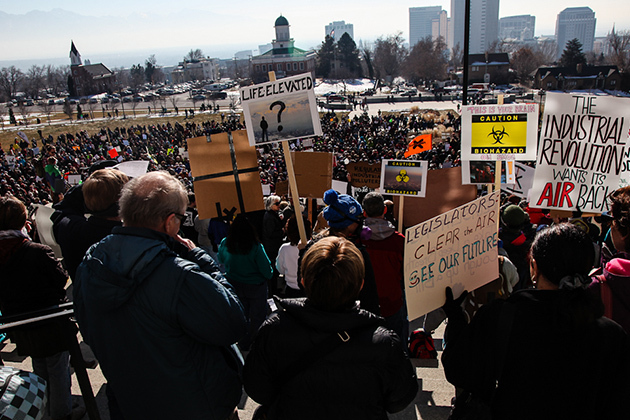 The rally itself was the work of organizations such as Utah Physicians for a Healthy Environment, Communities for Clean Air, The Sierra Club, Clean Air Utah, Utah Moms For Clean Air and the Healthy Environment Alliance of Utah. But as a voice that's very relatable to the more than 20 million tourists who visit Utah each year, AFCA could become significant in a state where the energy and extraction industries have a disproportionate say on Capital Hill. According to government figures, energy development accounts for 17,000 jobs in Utah, compared to roughly 124,000 who work in the tourism and travel industry. The 4-5,000 people marching on Capital Hill, meanwhile, were five times what organizers initially said they hoped to attract on their Facebook page. 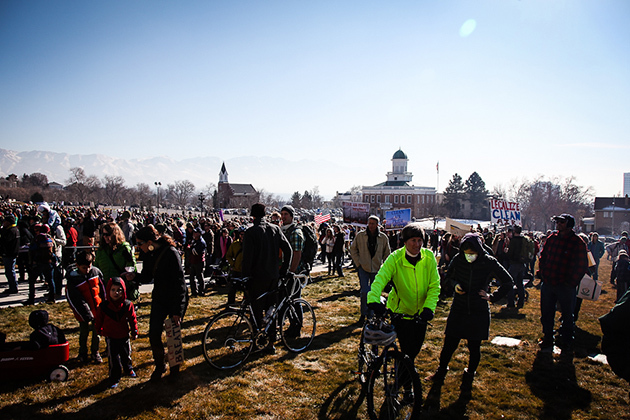 It was the largest air pollution protest ever in Utah. "Even cooler than the total turnout was the amount of people who chose alternative transportation to get to the rally," says Batty. "We were ecstatic to see the train stations and bus stops filled to the brim… to see people riding bikes and walking and pushing strollers and pulling wagons." Utahns, it seems, finally found a good winter day to get out and ride a bike – even if it was for the wrong reason.